Digging through an early book on computer games titled Game Playing with Computers (Donald D. Spencer, 1968) and discovered two early computer games that have so far been almost completely ignored in the literature (which is kind of odd, considering one of them is well documented in an oral interview – though Judd Ruggill published an article referring to it in the Spring 2009 issue of Cinema Journal). The first of these is a little more light on the previously re-rediscovered Tic-Tac-Toe game by Charles Babbage (Spencer refers to it as well). The only additional information I have to add here is that Babbage wanted to design a Tic-Tac-Toe playing computer he could use to help fund his more serious project – he would charge gawkers a fee to play the game (making it the first computer game designed for a profit). However, the machine was never built. So according to Spencer, Babbage had more than simply a prefigure of the idea. The second – and this is VERY surprising – is the Nimatron, designed by Edward U Condon in 1939 (displayed in 1940). Condon (apparently better known for his UFO studies) had the idea to build a machine that would play Nim at the New York World’s Fair to help enliven the Westinghouse booth, where it was enjoyed by over 50,000 people (the computer had a counter to tally the number of games as well as wins and losses. While the exact numbers are unknown, approximately 5-10% of players managed to beat it). It was later displayed in the Buell Planetarium in Pittsburgh. Instead of picking up matches, what it did was to have banks of lights— think there were four banks of up to eight lights, something like that—and it was programmed to challenge you with a game by which lights were lit up then in the four columns. Then you were allowed to go up and take your choice of pressing a button any number of times that would turn out the lights, that was the equivalent of picking up matches in any one column. But you couldn’t then press the button for another column—there was an interlock—without first pressing a button that would give the machine its play. Similar to NIMROD/NIM (1951), this game displayed the state of the board visually (and therefore probably serves as precursor to even OXO in this regard). Condon also was amused by the game’s speed at computation, which would take its move in a microsecond, leaving the player dumbfounded and thinking himself an idiot – an important observation! However, Condon slowed down the speed of the relays to make it seem like the Nimatron was taking a few seconds to think it over – what he feels might be the first deliberate slowing of a computer. Nimatron was also purposefully disabled because the game was essentially solved – there were sixteen possible win strategies. Also in a move that would be certain to please (or perhaps displease?) Ralph Baer, the idea of storing numbers in binary was patented as “Machine to Play Game of NIM” with the description “any electrical means of representing a number as the sum of integral multiples of powers of another number.” Unfortunately for Condon (and therefore, as far as Baer is concerned, no feathers missing from his cap), neither he nor anyone else at Westinghouse understood the significance of this patent and so nothing ever came of it (it doesn’t even seem to have inspired NIMROD). Nimatron is particularly surprising because it predates the famous Goldsmith and Mann patent for a Cathode-Ray Tube Amusement Device(1947) as well as what was previously the earliest-known games running on a computer (Claude Shannon’s Chess and NIMROD). What’s more, it was actually realized as a machine (Goldsmith & Mann’s device was not). 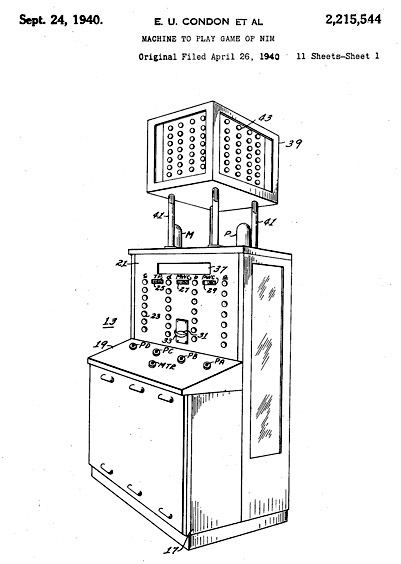 A laterpatent filed in 1968 and cleared in 1971 describes a different electromechanical machine for playing Nim using marbles. Still another patent, filed in 1970, describes what appears to be a computer for playing Bridge. Also interesting is that Nimatron was played by thousands of people at the World’s Fair, so a more detailed survey of the literature will be required in order to determine if any subsequent computer designers were aware of Nimatron. Spencer does not reference where he got his source (it’s possible this was ‘common knowledge’ in his field, as the extensive bibliography of books on games reveals little specific and no patent is mentioned). Game Playing with Computers seems in some large part to be Spencer’s affirmation of his company’s work and their alliances with IBM. There is no discussion of Digital Equipment Corporation’s machines, despite the obvious need for a Spacewar reference. This leads me to believe the book to be as much political as it is informative. In addition to Nimatron, Spencer surveys other games designed with computers in broad categories of Tic-Tac-Toe, Go, Go-Moko, Chess, Checkers, Nim, Pentominoes, Wolf Goat and Cabbage Puzzle, The Knight’s Tour, 15 Puzzle, Slot Machines, Prime Numbers, Blackjack, Roulette, and Magic Squares (aka Sudoku – which I have zero interest in playing now that I know computers have been solving them since the 60s). This entry was posted on May 18, 2010 at 4:36 am and is filed under Uncategorized. You can follow any responses to this entry through the RSS 2.0 feed. You can leave a response, or trackback from your own site. I just found a claim from 1878 (yes, eighteen-78) of an actual built machine that would play tic tac toe without ever losing. Frank Freeland designed and built it, and it was allegedly given to the Franklin Institute, and then on to the University of Pennsylvania.